To Sum It Up: Widge and the Lord Chamberlain’s Men are back in London, but their troubles are far from over. With Queen Elizabeth’s health failing, there is a lot of anxiety over her successor and the future of the theaters. The unexpected arrival of William Shakespeare’s daughter, Judith, disconcerts not only her father but Widge as well when the latter finds himself smitten with her. There’s also a thief among the company, and Widge’s past deeds cast suspicion over him. To dispel the doubts over his innocence, Widge must go on an undercover mission to unmask the real culprit. Review: After finding Shakespeare’s Scribe, the middle book in this series, a bit of a letdown compared to the previous book, The Shakespeare Stealer, I began reading this with a little hesitance. I felt that neither the story nor the characters from the first book advanced very far in the sequel. My fondness for The Shakespeare Stealer, which was a delightful read, is what motivated me to finish out the series. 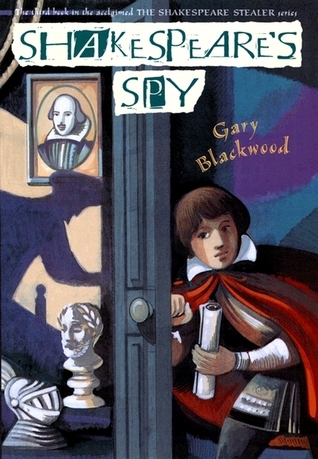 While I still think that The Shakespeare Stealer is the strongest entry in the trilogy, Shakespeare’s Spy recaptures some of the charm that made the first book so winning and is a definite step up in plotting and character development from its predecessor. Whereas Shakespeare’s Scribe focused on the Lord Chamberlain’s Men’s travels through the English countryside, Shakespeare’s Spy finds the company back in London now that the theaters have been reopened following a plague outbreak. I didn’t find the company’s journeys very compelling, so I was glad to see the story return to its original setting, as well as proceed at a crisper pace than it during the road trip. In addition to worrying about the future of the theaters, William Shakespeare has a rather large problem to contend with right under the Globe’s own roof: there is a thief among his players. At first a few costumes go missing, but when a member of a rival acting company is caught stealing a script from the Lord Chamberlain’s Men, it appears that he had some inside help. Figuring out the identity of the accomplice wasn’t all that difficult, but it was an entertaining plotline nonetheless. I wasn’t as keen to see the Who Is Widge’s Father? subplot reappear because I found it rather labored in Shakespeare’s Scribe. This story line aside, Shakespeare's Spy moved at a pace that kept me invested in the story and eager to see the thief/spy unmasked. I’ve liked the protagonist, Widge, since the beginning of the series, so it was disappointing when his character in the second book pretty much turned in a repeat performance from the first one. Fortunately, he undergoes significant growth throughout this book. Widge becomes like an older brother to the younger children in the household of Mr. Pope, the member of the Lord Chamberlain’s Men who took Widge in when the latter first joined the company. Widge also finds himself competing with two of his fellow apprentices for the attention of Shakespeare’s daughter, Judith, who arrives in London unexpectedly. In an effort to impress her, Widge tells Judith that he’s writing a play. He isn’t really at first, but luckily for him, Shakespeare gives him an abandoned draft and permission to do whatever he likes with it. And so Widge’s career as a playwright begins. By the end of the novel, he has come a long way from the humble orphan of the first book, and I thought that his tale reached a very satisfying conclusion. Readers who have been with the series from the start should be pleased with this finale. I liked how various threads of Widge’s life from the previous books came full circle. In The Shakespeare Stealer, his knowledge of shorthand is what makes him the perfect person to steal Hamlet by transcribing it from a performance. In Shakespeare’s Spy, it’s that same knowledge of shorthand that helps Widge uncover the real thief who’s been lurking around the Globe. Blackwood really brought this historic era to life. I wish that I’d read a series like this as a kid because I definitely would have wanted to learn more about Shakespeare and his times way before I went to high school, when I finally read my first Shakespearean play (which was Romeo and Juliet). All in All: The series lost a bit of its luster in my eyes with Shakespeare’s Scribe, but it recovers nicely here. I’ll reiterate what I said in my review of The Shakespeare Stealer: I truly think that these books are a great introduction to Shakespeare for younger readers. Being a huge Shakespeare fan myself, I love seeing other readers fall in love with his work, too. Ah, sounds like a great series for younger readers. Glad to hear that the third book in the trilogy was better than the second book and it kind of got the spark back! ;) Great review! I was really happy to see the series end on a high note, and I do think that these books are perfect for younger readers. Interesting series. I'll take a look at the first book. I really liked the first book- definitely the best of the three, at least in my opinion.